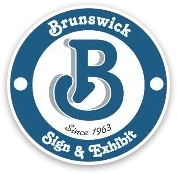 Brunswick Sign & Exhibit is a full service sign, graphics and awning company. Since 1963 we have met our customers’ demands for excellence in image information and communication - all at a cost effective price. In our 15,000 sq. ft facility our staff of sign professionals use the latest computer aided design and fabrication technology to produce signs, graphics and awnings that will meet your highest expectations. From custom "one of a kind" designs to large scale sign programs; our turn-key approach takes your project from initial survey to concept and design, permits, fabrication and installation. Afterwards, we'll keep your image looking great with full-service repairs, maintenance and cleaning. We are committed to making you look great!